The only other time I found myself in an inter-island ferry was when I assumed the role of a photographer’s assistant, from Cagayan de Oro to Camiguin. Having settled myself in the airconditioned area of the Bohol-bound Oceanjet ferry, I deemed it satisfactory that I didn’t opt for the open area. Again, the picture-taking mood wasn’t too persistent. I left Kaloy’s place, just a few minutes away from University of San Carlos, with an hour to spare. When I told the cab driver I was headed to the pier, he made the claim that it would probably take us an hour and a half of travel time, considering weekday morning traffic. I got to the pier in time, anyway. With two donuts for nutrition, and a ferry population that appeared to consist of 40% Japanese, 20% Korean, 20% Chinese, 10% Caucasian, and 10% everyone else, I was off to the the real solo segment of the birthday trip. With my budget dwindling, I decided to call Tierra Azul, where I would stay for the next two days, right after arriving at Tagbilaran City, and ask them for advice on how I’d get there. A tricycle could take me, for 250 pesos, which was a fair enough price vs. hired car travel. So I took one. Tagbilaran seems spare, provincial, but sufficient. The weather was hot, but normal-hot. I’d imagine Manila and/or Bulacan would be rainy at this time. I reached Panglao around noontime, and settled at the 2-bed fan room for a thousand pesos a night, which includes breakfast, but, to my surprise, no TV. It wasn’t beachfront accommodation, but I was steps away from the beach. Starving, I went along the path of bars and restaurants, and took a seat at Trudi’s, practically because they had open wi-fi. Now this is where I got some flak from my social network, with a handful claiming I shouldn’t do real-time sharing of photos, update my Facebook status as to my vacation predicament. My points to ponder on: I wasn’t in ecstatic bliss, I was in a beach equivalent of a mall. I was alone, with a very slim chance to break a chat with anyone. I let people know where I am when I feel like it. 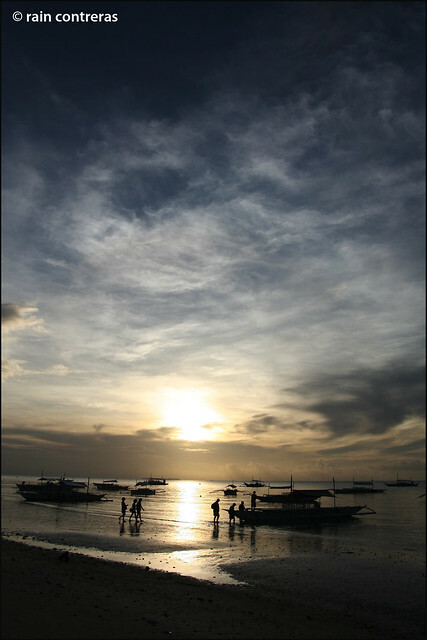 The rest of the mostly sunny afternoon was spent at Alona Beach, which gladly only had few tourists. The sand was white, the water wasn’t too clear, and there was steady arrival of half-foot waves. The boats docked themselves along the length of the beach, which was a disappointment, since the same water I’ll be immersing myself in is bound to have motor fuel in it. Rainclouds came, did some work, and left. Tired, I opted for a nap, and woke up hungry. I was back at Trudi’s for dinner, and had the early, but easy conclusion that this tourist scene wasn’t for me. The tricycle driver who took me to Panglao yesterday arrived again in the morning, as I had made arrangements with him that he take me to the usual Bohol tourist spots. Had a quick breakfast, and saw a cute bunch of girls who seemed to be headed off to a boat tour at the front desk. I figured this was my chance to actually meet people here, but then circumstances then didn’t give me room to take any step at all. First stop of the tour was the Blood Compact site, then we were off to Chocolate Hills. 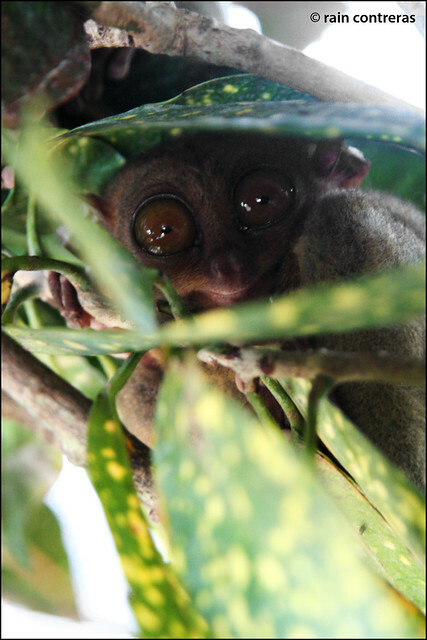 We had a brief stop though at a tarsier conservation area, where I spent a good time taking snaps. 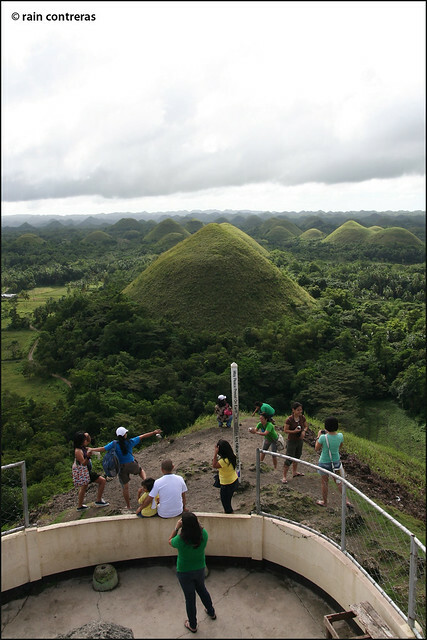 Seeing the Chocolate Hills was easy, obvious, and a wonderful trip-highlight, if only I didn’t have to go up so high on foot to get the best view. See, I have mild acrophobia, but this definitely wasn’t the time to panic, this was the time to take pictures. I’m glad I didn’t know anyone there, no explanations were needed to point out how slow my ascent was, and why I couldn’t easily let go of the guardrails. I wanted to stop the driver from taking me to the Simply Butterflies Conservation Center, considering it as an unnecessary stop, and that I’ve already had my fair share of going to other same places, but I gave in. I had the mahogany man-made forest next, covering the border of Carmen and Bilar, which I already marveled at on the way to Chocolate Hills. 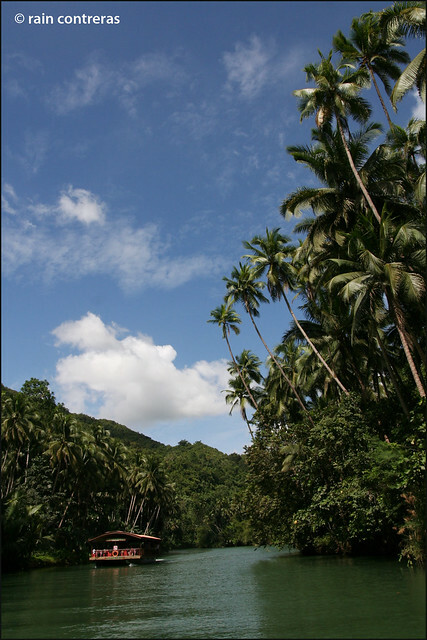 Then it was off to Loboc, where, again, I had hesitations of taking the Loboc River tour. The river was in great condition, the scenery was nothing spectacular, but wonderful nonetheless. If only I can say the same thing for the normal-fare food, and the awkward experience of sharing a buffet table with what looked like a pinay and Caucasian date. I didn’t mind the noontime sun, so I visited the church and the patio. I wished I did speak bisaya then, as there seemed to be a few social activities going on around that time. I was now in the mood to take photos, more like an amateur with photojournalistic leanings than a tourist. It just didn’t feel right to poke my nose then, I stuck out too much. 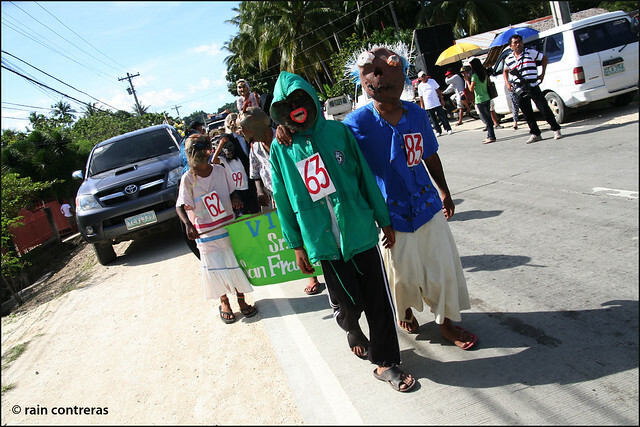 On the way to Baclayon, there was a procession for the Sambat Mascara y Regatta Festival in Loay, which was an extra treat/photo-op. The last stop of the standard Bohol tourist tour was Baclayon Church, the second oldest stone church in the Philippines. 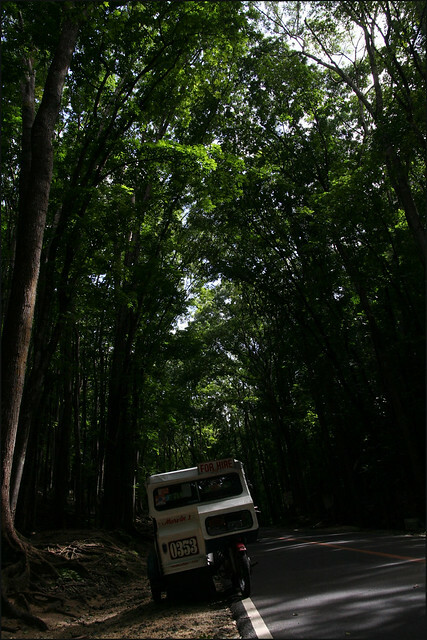 By this time, my DSLR camera batteries were all drained, and I resorted to shooting with a point-and-shoot. They didn’t allow picture-taking at the Baclayon Church Museum, but if one does appreciate Catholic history, its a good visit. Blame it on my photography group, and my sticking it out with Catholicism, but since I didn’t have anything much planned for this leg of the trip, I might as well visit what I can of Bohol chruches. 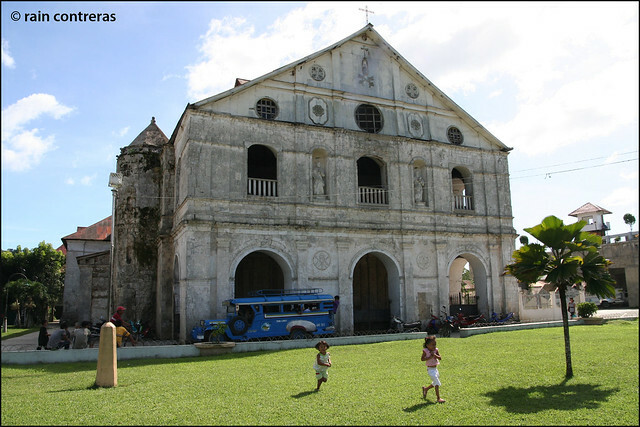 The short Panglao Island tour starts at Dauis Church, where they had miraculous water for devotees. 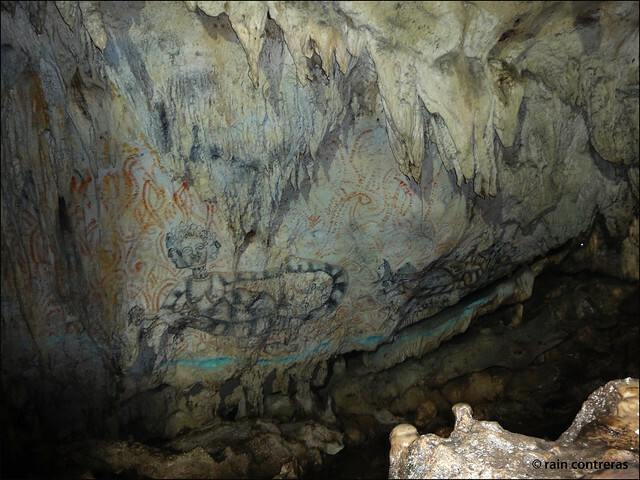 Hinagdanan Cave came next, where I would’ve wanted my better camera revived. 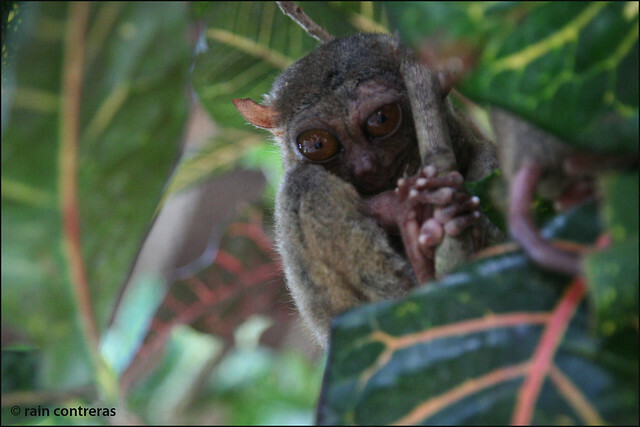 The WTF stop was at a ho-hum mini-zoo, a waste of the 15-peso entrance. 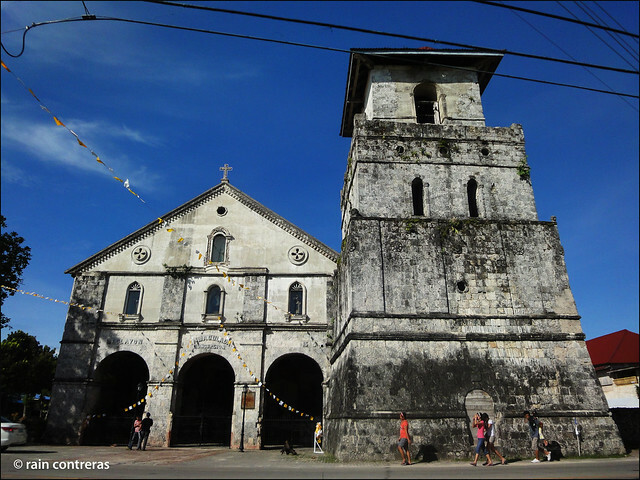 Last on the itinerary was Panglao Church. Back at the beach, the sun was gone, I had dinner at the usual spot, and I gave up any hopes of being the social animal man was meant to be. Those hopes weren’t high to begin with, though, but I’m not the sort to dismiss so easily. 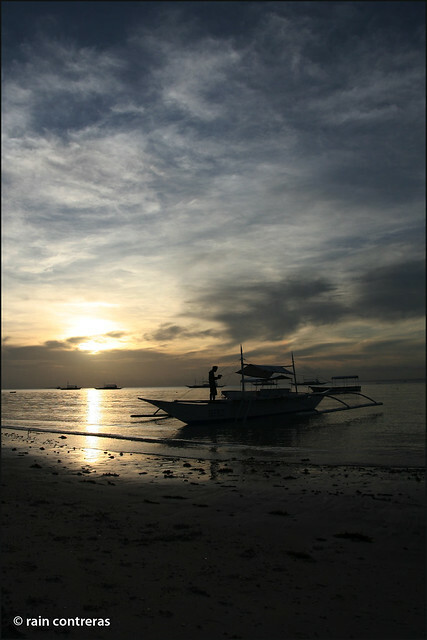 Before sunrise, I was up, shooting at what I can of Alona Beach on my last day in Bohol. My ferry back was at 9:30, and I did want to get back home with that tanned beach look, just to conform with what is expected of me. I was back in Cebu before noontime. I had contacted the same cab driver that toured me a few days before, and after buying the expected dried mangoes + danggit + dried pusit pasalubong at the market, we were off to Lapu-lapu City, to pick up my custom ukulele at Susing’s. A stopover was made on request of a fellow ukulele fan at Allegre Guitars, where they sold non-souvenir quality ukuleles for an atmospheric 10,000-28,000 pesos. Wallet exhausted, and my plane back to Manila a good few hours away, I asked to be dropped off to the nearest mall nearest the airport, which was the Gaisano Island Mall of Mactan. I spent most of the afternoon listening to the local radio stations, and killing time. An air of achievement hung over my head at the Mactan airport, on seeing the night landscape of Cebu, and finally arriving in Manila. I might as well do this again, solo or otherwise.